Now Featuring a 100 Year Warranty! The Wedding Gown Preservation Company puts the highest degree of professional care into the heirloom processing of your gown. First your gown is examined to find all spots. A detailed Quality Control Report is updated through each and every step. Proven formulas to remove spots and treat the entire gown for sugar stains. Your gown is thoroughly cleaned with extra attention given to the neckline, trim and hemlines. Our experts shape the gown, position a full bust form and fill the sleeves. It is then wrapped in acid-free tissue, and fitted carefully into a preservation chest with an acid-free display window. The preservation chest is then enclosed in a 700 pound test shipping carton. 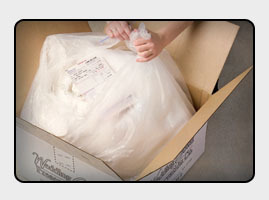 Your gown is then shipped back to you pre-paid anywhere in the Continental United States via Fed Ex Ground. The preservation process will be completed in 2 to 6 weeks after we receive it.